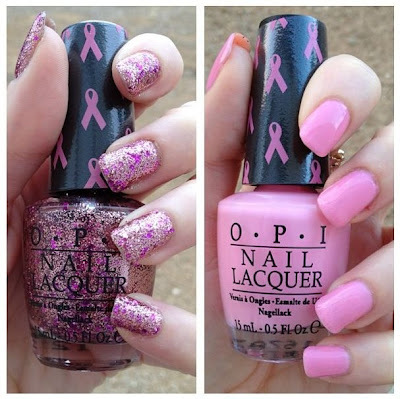 In keeping with Café Fashionista’s promise to bring you different beauty and fashion products that benefit Breast Cancer Awareness for the month of October, today I am bringing you OPI’s Pink of Hearts 2012 Breast Cancer Awareness Collection, which features one of the most awesome glitters ever. Swatch time! This is three coats of I Think in Pink, which is a super sheer (but very buildable) light pink creme. OPI states: You think – therefore you are…sure to love this dreamy sheer pink. The formula on this shade was beautiful – no streaking, bubbling, dragging. At one coat it was entirely sheer (as it’s meant to be), but at three coats it was completely opaque. Though I used Seche Vite top coat over this color, alone the shade was gorgeously glossy (enough so that you don’t need a top coat for extra shine). Accessories: Forever 21 Lacquered Flower Ring in Gold / Pink. This is three coats of You Glitter Be Good to Me, is total glittery goodness in a bottle that features copper-leaning pink micro-glitter mixed with fuchsia hexagon-shaped glitter (in two sizes). OPI states: You totally deserve this hopeful pink glitter. Like I Think In Pink, the formula on this one was perfect. Sometimes with glitters you get clumping, but I didn’t experience that here. This can be used for layering, but I used it alone for a truly eye-catching mani. What do you think of OPI's Pink of Hearts 2012 Breast Cancer Awareness Collection? What nail color are you rocking for #ManicureMonday? FTC Disclosure: The OPI Pink of Hearts 2012 Breast Cancer Awareness Collection was sent to me for review; however, all opinions expressed therein are my own. Such pretty pinks for such a good cause! Love your ring too. So sweet! I love the glitter one. Both would be great. Especially, the pink at work. What a great Monday post! This is so lovely! Beautiful ring too. I'm wearing PLUM POWER by Xtreme Wear. Oh wow! Love the pink!!! and the glitter ones are great for events! Ooooh I really love the glitter one! Awesome colors for a great cause! I just bought my first bottle of OPI for Sephora this weekend! LOVE it! I love the glitter ones! So so so pretty! This runs the gamut of pinks so nicely! I think that might be my favorite nail polish name ever... you glitter be good to me! love it and it really is a great color - I'm such a sucker for pink anyway. I love these OPI colors from when I first saw them on A Very Sweet Blog a couple weeks ago. The glitter is lovely, but I Think In Pink is cute all by itself. Love that color. Both are lovely shades, but pink glitter definitely has a hold on my inner little girl! Such an awesome post. I can't wait to wear pink! I've been wearing orange wayyyy too much this month! Love this collection! I will have to get this. I think it's a brilliant idea because you get something pretty and donate a little without making it too obvious. I blogged about Ciate campaign - they have a beautiful pink duo, too. Pretty. I have the sparkly one. 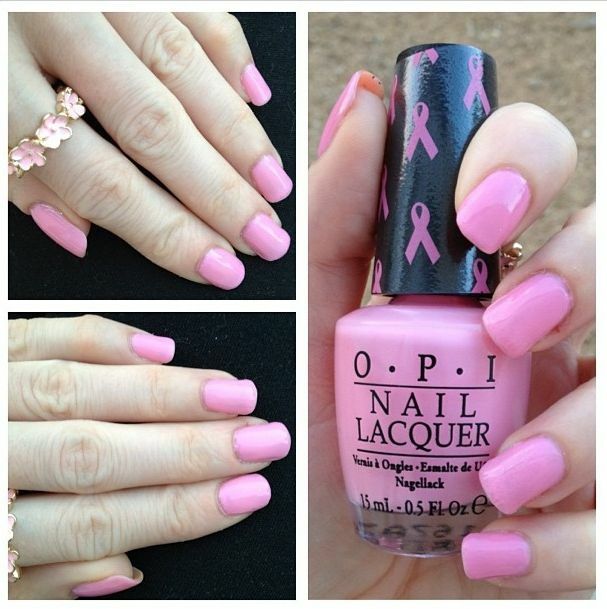 I love that OPI have done this for Breast Cancer Awareness Month. Both shades are perfect. Loving that pretty I Think In Pink polish! It's the perfect shade of pink -- so pretty! Hope you're off to a very happy new week Erika! oh these are too pretty! I really like the glitter one. I'm glad to hear it wasn't clumpy, as that's definitely a fear. Your ring this week is too cute as well. I love the glittery pink polish! So cute and for a great cause! Oooh, I love these! There's always time for pink I think - especially like the first non-glitter one. pink i think just might be the perfect shade of pink!! I love glitter nail polish but I always struggle getting it off! So I tend to steer clear and just enjoy it on others. I would however, love to own that pink nail polish.